Before your students can animate in Adobe Animate CC, they must learn how to draw objects such as lines, rectangles, squares, ovals, and circles. Making simple shapes can become complicated if students do not understand Object Drawing. 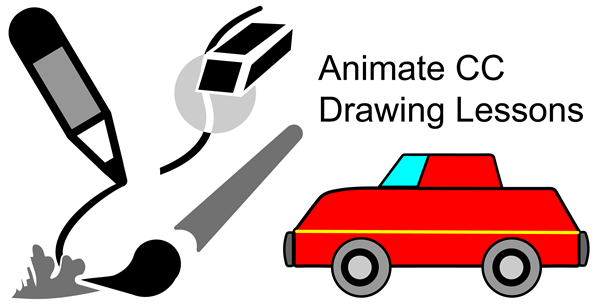 When teaching an Adobe Animate unit be sure to introduce the two drawing modes – Object Drawing Mode and Merge Drawing Mode. These modes control how a graphic can be edited on the stage. To avoid students’ frustration when drawing, emphasize the features of each drawing mode. Where is Object Drawing Mode in Animate CC? 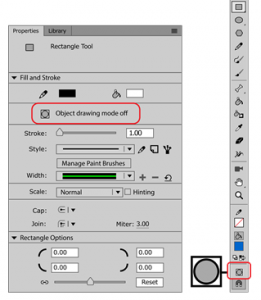 Object Drawing modes can be set for the following Animate CC tools: Line Tool, Rectangle Tool, Oval Tool, Pencil Tool, and Brush Tool. When the tool is selected the drawing mode option is displayed in the Property Inspector panel as an icon with a description of the status. It also appears on the Tools Panel at the bottom as an icon. When object drawing mode is turned on, the icon has a grey box around it . Object drawing mode creates a shape that is a separate graphic which sits above the stage. When selected, a bounding box surrounds the shape to show it is one complete object. The Property Inspector shows the status as “object drawing mode on”. The entire object is selected when it is clicked. The entire object is removed when the DELETE key is pressed. The stroke and fill are grouped. A bounding box surrounds the object when it is selected. Edits to the object are applied to the entire shape. The object moves freely on the stage. The object remains separate when other objects are placed in front of or behind it. An Editing Pane opens when the object is double clicked. When object drawing mode is turned off, the icon does not have a grey box around it . This drawing mode is called merge drawing mode. Merge drawing mode creates a shape that is made up of individual parts that are stuck on the stage. In this mode, the drawing will merge or combine with other shapes on the stage. The Property Inspector shows the status as “object drawing mode off”. Part of the object is selected when it is clicked. Part of the object can be removed when the DELETE key is pressed. The stroke and fill are separate. Dots appear in the part of the object that is selected. Edits to the object are applied to parts of the shape. The object does not move freely on the stage. The object combines with other objects when they are placed in front of or behind it. All the parts of the object are selected when it is double clicked. Create Lines and Shapes: Compare object drawing modes when drawing lines and shapes. Draw with the Pencil and Brush: Draw freehand to make a simple picture. Explore Drawing Tools on the Tool Panel: Discover the function of tools on the Tools Panel. Use Editing Pane to Make a Car: Arrange shapes to form a car. Customize the design. Take the Drawing Challenge: Apply your skills to draw a bear or chick.